Like many Americans, the chief economist at the Heritage Foundation, Stephen Moore, recently made his way to the summer blockbuster film Dawn of the Planet of the Apes. As he reflected on the film in the National Review Online, he was struck by the role energy played in the plot. 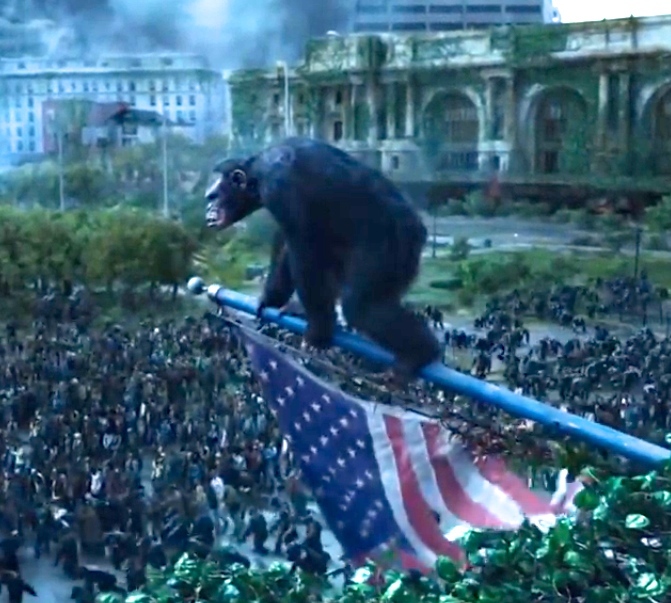 Moore may have missed an even subtler message in the film: The apes in the movie flourished and developed a very sophisticated society without any addiction to electricity whatsoever. But let's stick to Moore's takeaway, which is that "radical Greens," like Tom Steyer, the Sierra Club and President Barack Obama, want to take us all back to the Stone Age by transitioning the nation to more expensive, therefore less accessible, sources of power than natural gas and coal and oil. "Sorry, for the foreseeable future, we aren't going to get our power for our $18 trillion economy from wind turbines and solar panels," he apologizes, adding, "...if we begin to try, prices are going to skyrocket." One of the many problems with his summarily dismissing any effort to move toward renewables is that Moore overlooks the important role of efficiency. Using less energy does not return us to the Stone Age, but it does make it entirely possible and practical to transition our economy off fossil fuel. Stanford scientist Mark Jacobson, who heads up The Solutions Project, provides research showing that using wind, water and solar electricity for everything, instead of burning fuel, plus improving energy efficiency means we would need much less energy. The project provides data that shows regional renewable resource availability and spells out a practical energy mix for each state that does not include coal, oil or natural gas. For example, California has the potential to meet all of its energy needs by 2050 with a mix of 55% solar, 35% wind, 5% geothermal, and 4% hydro electricity. The Solutions Project--funded and promoted by Hollywood's Mark Ruffalo, Marco Krapels and Josh Fox--shows a specific pathway for each state to be fully powered by renewables by 2050 and shows that even movie stars and filmmakers may know more about energy than the Heritage Foundation, and by association the National Review. Moore bases his argument against a transition to renewables on cost. Never mind the increase in jobs and the economic benefits of developing this innovative energy sector, when it comes to fossil fuel, price never reflects cost. As Amory Lovins and his staff at Rocky Mountain Institute point out in Reinventing Fire, one of the first road maps for getting the nation of oil and coal by 2050, "Tens of billions of taxpayer dollars each year subsidize America's fossil fuels, and even more flow to the systems that burn those fuels, distorting market choices by making the fuels look far cheaper than they really are." There's no credible reason to concede that energy prices will go up if we transition to renewables but, for the sake of argument, let's imagine Moore is right and energy prices do go up. What is the cost of millions of asthma deaths? What is the global cost of flooding, disease and destruction directly caused by climate change? Moore either sees no connection between fossil fuel use and climate or he believes there will be no financial ramifications to climate change. A report commissioned by the United Nations and issued in July 2014 by the Deep Decarbonization Project sums up the economic risks of unabated climate change in a nutshell. These risks, the report states, "threaten to roll back the fruits of decades of growth and development, undermine prosperity, and jeopardize countries' ability to achieve even the most basic socio-economic development goals in the future, including the eradication of poverty and continued economic growth. These risks affect all developed and developing countries alike." Pathways to Decarbonization provides yet another clear and specific roadmap that looks beyond the US to how individual countries can transition to a low-carbon economy and how the world can meet the internationally agreed on target of limiting the increase in global mean surface temperature to less than 2 degrees Celsius. Perhaps paying a little extra to charge the electric vehicle will be slightly cheaper than the phenomenal costs of climate change. But then again, don't miss the subtle message of the radical Green movie producers glorifying the wisdom of the animal kingdom: Apes don't drive cars. Note: My thanks to Dan Lashof of NextGen Climate America for providing me with the studies I mention in this post. Read Dan's response to Stephen Moore.